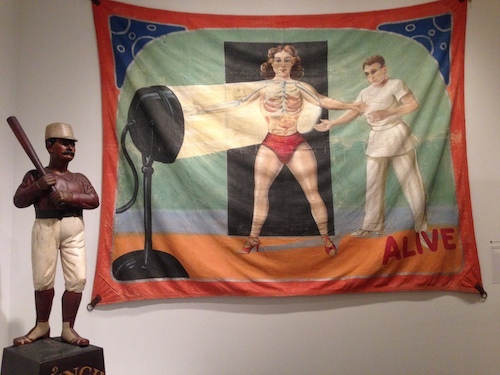 The American Folk Art Museum knows how to put on a show and take it on the road. After today, the staff will be packing up Self-Taught Genius: Treasures from the American Folk Art Museum and letting the Brooklyn Lion, Connecticut’s Weathervane Elephant, Chicago’s Sideshow “Radium Girl”, and a baseball old-timer from Centre Street see what’s up in Davenport, San Diego, Fort Worth, New Orleans, Saint Louis, and Tampa. We’re betting that there will be crowds waiting to greet them. 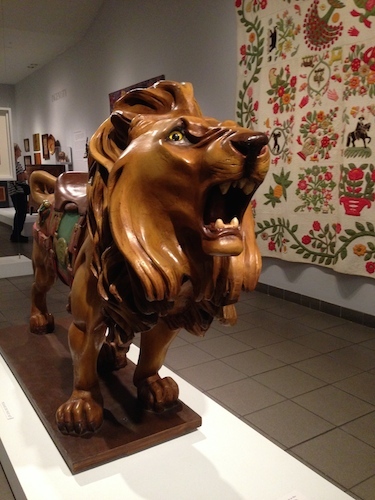 The museum’s staff has brought out its best to show off four centuries of made-in-America maker art – furniture, sculptures, textiles, painting, and what-not. It’s genius that they’ve put the spotlight on “genius” because their collection is jam-packed with some truly remarkable artists, visionaries, and craftsmen. Get the full view on the Museum web site and some close-ups on our Flickr page. The curators say that the United States was a make-it-up-as-you-go-along democracy, so they felt “self taught” was right in line with this unique Americana theme – having a vision and making a masterwork. Empire State Building, carved in New Jersey in 1931 from precious cherry wood. Auriti’s Palace is just behind. Yes, there are some true eccentrics in the mix, but let’s momentarily focus on the People with a Plan from the section of the show on “Achievers”. Their works are immensely pleasurable and intense, and they’re right inside the entry. 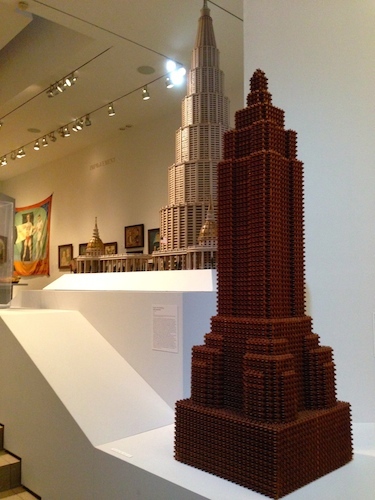 You could spend hours contemplating the detail and work that went into the monumental Empire State Building made from cut cherry wood pieces in New Jersey in 1931. No one knows who created it, but legend has it that it was an ironworker that actually worked on that 13-month wonder and couldn’t let go of the achievement. 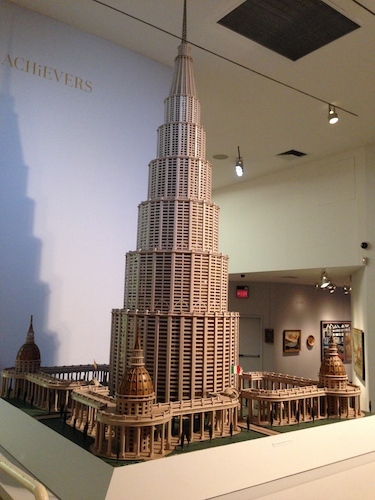 Consider The Encyclopedic Palace of the World, created by Maurino Auriti, an auto body worker who just loved designing and building architecture. Mind blowing. If his visionary campus was actually constructed, the skyscraper would be taller than that spire in Dubai. If you get to Lincoln Square today, you’ll enjoy one amazing treasure after another, but if not, check it out the beautiful web site archive created by the museum team for the tour. Browse by time period, theme, or artist. And check out the Museum’s other brilliant online solution to letting you in on the world’s interpretation of these works. They’ve assembled all the media written and produced about the pieces in the show, which have often served as a springboard for scholarly research. This is a fun, serious treasure chest of work, so probe to your heart’s content — baseball folk art, mourning pictures, 18th century folk-art Washington portraits, and even more recent works. What will it take to take this show of masterworks on the road? Last year, Auriti’s The Encyclopedic Palace was chosen as the theme of the 55th International Venice Biennial, so it got to go on its first trip to Italy. Get a glimpse of where the folk art lives when it’s not on display and see how art gets packed to take a trip. This entry was posted in Art, History, Museums and tagged architecture, arts, Brooklyn, culture, design, history, museums, painting, sculpture by mssusanb. Bookmark the permalink. I saw the exhibition on its penultimate day, and it was a marvel. The objects were beautifully installed, and the label information, fascinating. I’m glad the objects will be seen in other areas of the country. Thank you. I’ve already heard from people in the Midwest who are planning a trip to Davenport.